The great ocean liners have an ability to transcend their innate body of steel, wood and mechanicals and develop a persona that draws passengers year after year. Launched in 1939, the S.S. America was thought by many to be the perfect ocean liner, not to big so as to overwhelm, not to flashy or pretentious so as to intimidate. She charmed her passengers with a comfortable interiors that combined warmth and sophistication, without being stuffy, beauty and grace without the glitz and glitter. Seen from afar, her two great red white and blue stacks, canted aft gave her a modern jaunty American look. Up close, standing near the bow, looking down her long sleek black hull and up to the top of her ten decks she appeared immense, and capable of sailing safely through any North Atlantic storm. The America has a great story to tell and the following pages will be enjoyed bty those who sailed on her – and those who wish they had. THE S S AMERICA THE MANY LIVES OF A GREAT SHIP. August 31, 1939, Newport News Va… Over 30,000 spectators showed up at the Newport News Shipyard. Americans were proud of their new ocean liner. A sailing ambassador the new ship represented the best of the nation’s technology, art, style and way of life at a time when ocean liners were objects of national pride. Above the crowd newsreel cameras jostled for position and, across the country, radio listeners tuned in the live broadcast offered by three national radio networks. At 11:50 AM the tide crested in the James River and with the words ‘ I Christen Thee America”, First Lady Eleanor Roosevelt smashed a bottle of Ohio Champagne against the bow and sent the new ocean liner sliding down the way. This auspicious beginning was immediately overshadowed by world events. The day after the America was launched; Nazi Germany invaded Poland and engulfed the world in war. After a brief cruising career the new ship was converted to the troopship USS West Point. Her speed was her most valuable asset and she spent the war years delivering thousands of troops around the globe. The stated mission of the USS WEST POINT was simple and to the point, “The safe transportation of troops and equipment to their destination”. In its 53-month life as a naval transport (designated AP-23) she and her dedicated crew, carried more than half a million military and civilian passengers, all the while maintaining a perfect record of never losing a passenger. By practicing and living the mission, the members of the crew provided reassurance to many a GI who had never been to sea. As one GI put it “from the moment you stepped on board… you had an overwhelming sense of security. You felt certain that this ship would take you to your destination, come hell or high water”. Passengers and crew together ran into their share of hell and high water, including close calls with U-boat torpedoes, Japanese bombers and North Atlantic storms. Her outstanding record, in the face of man-made and natural adversity was a combination of the dedication of the crew, sailing on one of the safest ships ever designed, and – perhaps – a little Old-fashioned American luck. 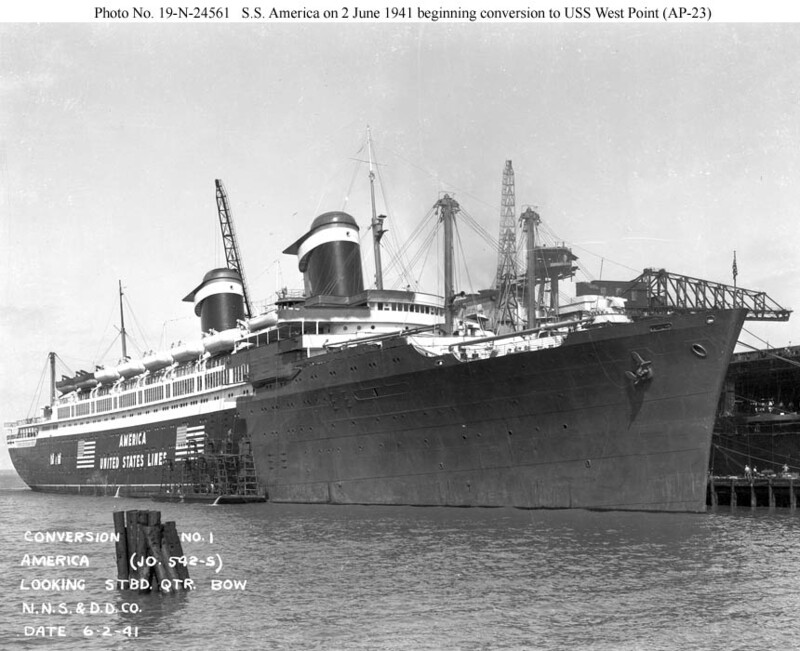 A meticulous, multi-million dollar restoration commenced immediately after the war, one benefiting her peacetime role as “Queen of the American Merchant Marine.” After sailing proudly and majestically into New York harbor on November 10,1946, SS America finally began her long delayed transatlantic career. Her 18 service with United States Lines ended in November 1964. In peacetime she transported over 500,000 passengers safely, and elegantly, while steaming over 2.8 million nautical miles in the process. The AUSTRALIAN MAIDEN – SS AUSTRALIS 1964 -1978. Sold to the Greek Chandris Lines for use in emigrant service from England to Australia and New Zealand. Renamed Australis, her superstructure was extended and passenger capacity doubled. For comfort sailing through the tropics a large outdoor swimming pool and air-conditioned were added . The “Australian Maiden” completed 62 global voyages (1965-1977) transporting over 300,000 hopeful souls to a new life. In 1978. Chandris sold the Australis to a group of travel agents. Renamed America, she sailed on cruises to ‘nowhere’ out of New York. No where is where the business venture went. After two disastrous sailings the inexperienced owners abandoned the ship. Chandris Lines bought the ship back at a bankruptcy auction. Renamed Italis she sailed with her badly corroded forward funnel removed, giving the ship a stunted look. At 40 years of age the old girl had a hard time keeping up with the newer ships. Although the public rooms were still grand, other areas were not at all up to current cruise ship standards. Many of the cabins were in a deteriorated state, and a bent propeller sent pulsating vibration through the lower decks. In 1979, after 40 years of carrying passengers she sailed into retirement. For the next ten years the Ex America, West Point, Australis, America 2, and Italis languished with the other rusting hulks in the “Graveyard of Abandonment” at Elefsina Greece. In late 1992, ambitious plans to convert her to a five star hotel were announced. Renamed American Star, she left under tow for Thailand, but severed weather off the Canary Islands caused her towline to break. On January 18, 1994 she ran hard aground and ultimately broke in half, a sad end to her long, glorious and storied career. The Many lives of a great ship. SS American Star 1993-1994 Chaophraya Development and Transportation LTD.
" What great memories I have if this beautiful lady. It saddens me to see how she ended even if it is fitting that she is in the sea. I came back to New York on the SS United States and enjoyed that great ship as well. I wish they could preserve her somehow after all, she and the America were our flagships!" In the red, white and blue. As the sun picks peeling paint.